This is luxury waterfront living at its best! This 6 Bedroom home sleeps 18 in beds and this unique home has a 2 bedroom 2 bath apartment and a 4 bedroom, 3 bath main level which makes the entire home 6 bedrooms, 5 baths! 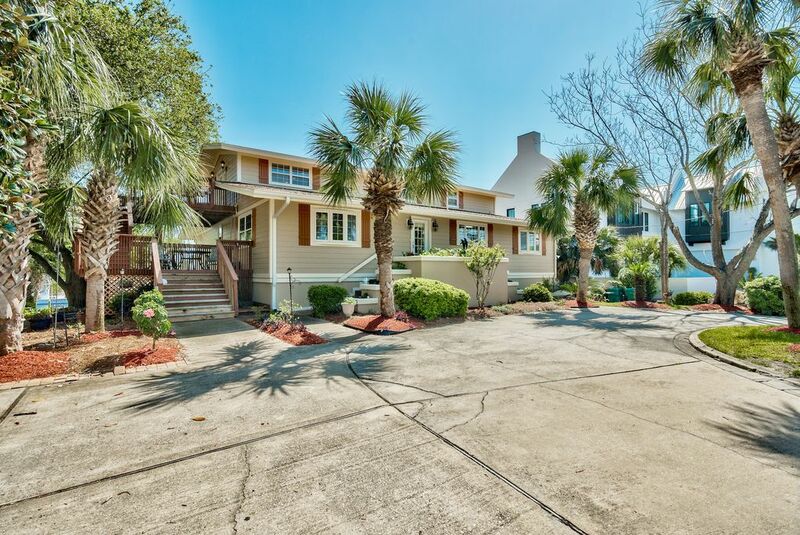 Ideal for family reunions, small weddings, or simply a fun loving group of friends who wish to have a great spacious home in Destin! This Home can easily accomadate groups of up to 20 people. Located on Holiday Isle with its salt-water canals, beautiful private beaches, emerald water, pleasure craft, and water sports.You can rent our 24 ft Pontoon Boat to enjoy Destin by water! Take a walk, or bike on the wide sidewalk around the Isle. Enjoy fishing or boating right out your back door or take a short walk to the sugar-white beach. You are right in the Heart of Destin, it does not get any better than this! This home is approximately 4000 square feet with approximately 2000 square feet of wood decking of which 800 square feet is covered. Rental includes 50-foot lateral boat dock to make harbor, gulf, or bay access simple, with electric and water. Put your boat in at the beginning of your stay and have at your back door whenever you want it! The canal is great for boating, swimming. diving and fishing. Enjoy the beautiful Destin sunsets, air shows and Fireworks every Thursday and Sunday from one of the 5 spacious deck options. Designed with families in mind...we are in a quiet residential neighborhood, where all day you see families walking to the beach or loading up to go out for a day of boating! It is fun to stay and play right in the yard on the dock. Fishing, swimming, canoeing, paddleboarding are all right there for your enjoyment. Bicycling, walking, rollerblading along the islands 2 mile sidewalk is an everyday event. Our canal leads directly out to the Destin Harbor, where the charter fishing boats are docked, from there you can go into the gulf or the bay or anchor right by the Destin Bridge at the popular crab island! Around the house you will find all of the comforts of home, nice patios, decks, bar-be-que pit....with 2 full kitchen and a bonus cooktop out on the covered deck. There are 2 washers and dryers and all the necessities for a relaxing week in beautiful Destin! The unique floor plan of the home provides a convenient level of togetherness with the option of privacy. The main floor is centrally divided by the living room and kitchen and has 2 bedrooms, 2 baths on one side and two bedrooms and a bath on the other side. Then the integrated upstairs is a complete apartment with another kitchen and its own washer and dryer with its own decks and entry. It is self contained 2 bedroom, 2 bath, living room, dining area and kitchen. In Summary you have 6 Private Bedroom Areas with a Total, 3 king beds, 5 queen beds, 2 queen sofa sleepers, 2 twin beds, and the option of one roll away bed. You have 5 bathrooms, plus an outside shower to rinse off the sand. You have 2 living areas, 3 eating areas, 2 full kitchens and a bonus cooktop on the covered deck, 2 washers and dryers. Over 2000 feet of decking, with approximately 800 feet of the deck is covered. You have convenient parking for 6 vehicles, since many areas of Destin do not allow trailer parking, we have off site parking for your boat trailers. We fell in Love with Destin many years ago, we started coming here for business and decided to work here in the real estate industry. We brought our children from the time they were babies and would stay for the entire summer enjoying all that Destin has to offer. We have had tons of family and friends over the years. We bought this home after hurricane opal and have renovated every inch of it. Now our children are in college and we don't utilize this house the way we did for many years, so we decided to share this great home with some other families to allow them to have some great Destin vacations and memories as we have! Destin is a great vacation destination, we love the fishing and boating, playing at crab island and watching the dolphins play. Everytime I go to the beach and see this gorgeous green water with the sparkling sugar sand the beauty of it overwhelms me. This home is really spectacular with the short walk to the beach and the inconvenience of having your water vessel at your disposal anytime you feel like jumping aboard! Here you also have the peacefulness of a quiet neighborhood to enjoy a good book or just watching the boats,fish and other wildlife swim or fly by! You really have the best of both worlds, something for everyone in one location! This is an amazing home with over 3600 square feet of living space and 2000 square feet of decking, which 600 feet of the deck is enclosed, a nice yard beautfully lanscaped, with large bedrooms and spacious family areas. It is recently renovated and is very clean and updated. The large covered deck is very unique and is a great party room! It has a bar, cooktop and seating overlooking the canal right on this deck. Haborwalk Village has all the popular restaurants, recreation and The popular Destin Fishing Fleet. Just a short boat ride away! Located on a salt water canal that leads directly to the Destin Harbor within minutes by boat! Located on a salt water canal that leads to the Destin Harbor and the Popular Harborwalk Village and Crab Island! You can even rent a boat with this great home which is located on a salt water canal right in the heart of Destin, you can fish, swim, boat, canoe, kayak and play right in your back yard! Our canal leads out to the Destin Harbor where the charter boats are docked and you are minutes from the popular fun crab island and the great Destin Fishing! There are plenty of quality pillows, blankets and towels. You may want to bring your own beach towels! There is enough parking in our driveway to accommodate 6 to 8 vehicles! there are nice quality towels provided in each bathroom. You may want to bring your favorite beach towels! WiFi available thoughout the house and even on the decks! You have 3 complete cooktops and ovens. One upstairs, one on the main level and one on the outdoor covered deck! You have four full size ovens, two in the main living area with a convection microwave additional oven, 1 full size oven upstairs and 1 full size oven on the covered deck. Also a warming drawer! (3) You have a full size microwave on each level and one on the covered deck! There is a Kuerig in the main Kitchen, a Mr. Coffee upstairs and a large 50 cup coffee maker if you are having a party! There is a 4 slice bagel or bread toaster on the main level! There are plenty of dishes, serving accessories and utensils to serve at least 20 guests! There is two great tables that expand to 60 wide by 120 long, one in the main dining area and one on the covered deck! Many great family meals served at both! All flat screen TV.s through out the home! There is even one on the outdoor covered deck! (7) There is a 48' HDTV in the main level family room, there are TV's in 5 of the bedrooms and another TV in the Family area on the upper level. All have expanded cable. there are several DVD players around the house! You are welcome to take a book or two or more from our collection! You can leave one of your favorites if you like! I love to garden so I take pride in the beautiful flowers and landscaping around the home! Feel free to take a bananna tree or some cannas home with you! Paddle Boards are the rage in our area and we have a company that will deliver as many as you need to the dock for your Paddle Boarding experience! You can rent our 24 foot pontoon boat or bring your own and park it right at the dock! (5) You have a combination of 5 decks to enjoy! Plus there is a great shaded patio in the yard! This great home sits on the salt water canal so you have your boat at your door and you can fish, swim, canoe, kayak and have a great time without ever leaving the yard. Of course if you love the beautiful Destin Beaches that is just a short walk down the street! Great house for large group!!! We had a great time during our stay here with a large group of friends for a wedding. Amazing house with plenty of space to hang out and entertain. We had a family reunion / 50th anniversary celebration at this location. The location was perfect, close to everything we wanted to do. The kitchen was well stocked with everything we needed for the celebration. Beach access was great. Rooms were spacious and clean. We couldn't have been happier as it gave us the perfect location for an extended family to be together but not on top of each other. Great place to stay with a large family that enjoy having your boat at your back door! Beautiful house with lovely flowers all around. Bedrooms are great size. Kitchen is large enough for several to cook and clean at a time. Ms. Sally, the property manager, was easy to get a hold of if we had any questions or needs. This was the 2nd year in a row that my friends and I stayed at this beautiful home. We had a great Labor Day weekend. It is very spacious and roomy! The deck on the back is fabulous to watch the sun come up in the mornings and the boaters ride by in the canal in the afternoons. Mrs. Sally responded to my texts and phone calls in a promptly manner. It is everything we needed for a weekend/holiday getaway! Another Day in Paradise" reads one of the signs in the house that we rented from Sally Maurer. What an amazing home. It was so spacious and relaxing. The upstairs floor was perfect for the younger adults because it separated the late night, younger family members. The house was very clean and everything was in order when we arrived. The three full kitchens allowed us to have a junior chop competition and then all come together in the enclosed deck for the judging. We loved the enclosed back deck, which is where we spent a lot of our time. Nothing was more perfect in the mornings than having our coffee watching the fish jump out of the water. It was a glorious, fun-filled week as we celebrated our mother's 80th birthday. To top off the celebration we rented Sally's boat. Sally responded to our questions in a timely manner and we would not hesitate to call upon her again whenever our plans take us back to Destin. I hope to see your beautiful family all together again for many years in beautiful Destin Florida! This home is located on the salt water canal that you can fish, swim, snorkle, kayak, boat, canoe and totally enjoy! You also have a large yard for family backyard games! We also have a boat available for you to rent! You are a short walk to private beaches of Holiday Isle!